The following is a complete list of available themes for the main portions (main page, archives, etc.) of my site. When you make a selection, you will be returned to this page, but in the new theme. 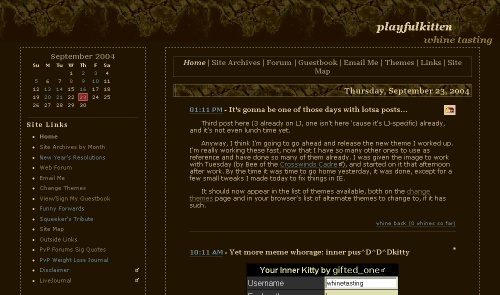 Once you've changed themes, that theme will be in use for every page that uses it, and will stay until you change it. Note: cookies are required for the theme change to "stick" between pages, and for it to last for the next time you're here. It will expire eventually, though (several months). If you use anything other than the default, you'll notice when that happens. If you're using Netscape 4.x, and using the read-only cookies.txt trick, then your choice will last as long as you have the browser open (even if you close that window, as long as you still have a window open). However, once you've closed all windows (browser, mail, etc. ), the cookie will be gone with all the rest. This is a kittens theme. It's mostly a white background with black text, with color accents for some titles, etc. 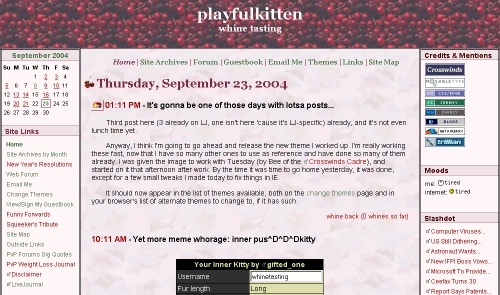 The main kitten background is a fixed background to the right, with the menu sliding over it with a much faded out version of the background which is also fixed, giving the idea of the kitten being only partially blocked by the menu. The main content area has a faint paws background. Note: This is not a very IE friendly theme. 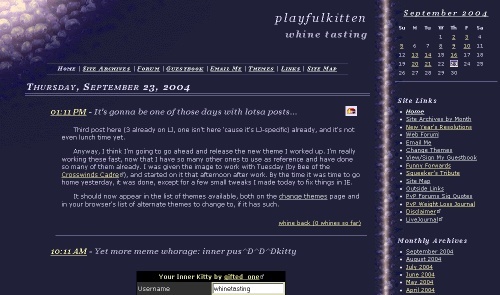 It is perfectly readable and usable, but IE doesn't do fixed backgrounds correctly on elements other than the body; thus, the opacity thing I told you about won't work because it handles the faded kitten background completely wrong. Thus you'll need a more standards compliant browser for this one if you want the full effect. This is the default theme. It has a dark navy background with a fading corner background of blueberries in the top left corner, and has light blue text. It is a two-column layout with the menus to the right. 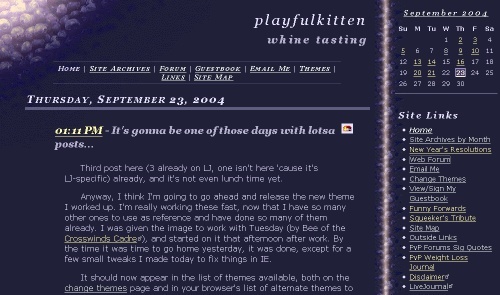 This is the same as the Blueberry theme, but with a noticably larger font for those who like the theme but whose eyes are not comfortable reading the small text. This is a theme with a horizontally tiled background of dark red cherries across the top and bottom, with pink-faded cherry blossoms as the main tiled background, and black text. The general shades are pinks and reds. It is a three-column layout with menus to both sides. 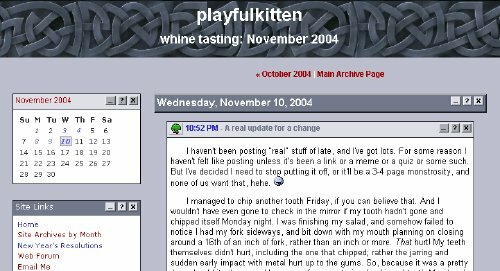 This is the same theme as the Cherries theme, but with a noticably larger font for those whose eyes are not comfortable with reading the small text. This is a light-colored theme with a horizontally-tiled background of embellished grapevine stencils across the top. Its background is a light yellow vaguely reminiscent of the shade of white wine, and the main text and accent colors are greens and purplish-pinks that compliment the colors in the border. It is a two-column layout with the menus to the left. This is a theme mostly in greys, inspired in parts by Windows text boxes, my current work desktop, and a very loud, orange-colored theme I found while looking for different creative CSS layouts. Its primary colors are various shades of grey, with black text and a white background under each box. The top main title has a Celtic-knot-style image based on a small portion of my work Windows desktop wallpaper, found at Deviant Art. Main subtitles are dark grey in background with light grey text, lesser subtitles are light grey in background with dark grey text, and all have Windows-styled minimize, maximize, and close buttons (nonfunctional) to the right (this is what my focus and non-focus window title bar colors were at that time, more or less). Links are dark red and dark blue. It is a two-column layout with the menu to the left. This is a light blue theme with a blue swirling-smoke horizontally-tiled background across the top (it is the same pattern, with different colors, as the top background image in Smokestone, and was created at the same time). Its main colors are various shades of blue (light for the background, dark for the text) with a medium, orangey brown and a medium grey for the link colors. It is a two-column layout with the menus to the left. This is the same layout as the Ice theme, but in opposite colors -- except for a few tweaks, this is an exact negative of the colors used in Ice (generated by using a Negative color effect on a screenshot of the Ice theme). Its primary colors are dark brown for the background, and golds and tans for text and borders, with blue and medium brown for the links and deep red as an accent. 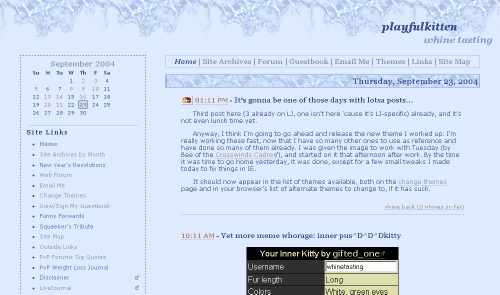 Its layout is identical to the Ice theme. This theme is based in purple and white, with a white tiger swathed in purple at the top. Most of the main content is in black text. It is a fixed width layout (don't worry, it's not ridiculously small, but should fit on a 800x600 sized browser with no H-scroll). The header tiger image may change, because I now have the original blank-background tiger image to mess with, but more than likely it will stay as-is. This is a theme based around a Tori Amos wallpaper. Its main background colors are light greys and almost whites, and text is mostly in almost black grey. There are also splashes of color inspired by the background itself, which features Tori in slight profile in color, and smaller in black and white. Its menu is to the left with a fixed size, and the main content is to the right and flexible in size. This theme works from a fullscreen 800x600 resolution and up. This is a darker, reds based theme with a rougher feel lent to it by the chosen background. It is a two column layout with the navigation to the right, and both the main content area and the menus are partially transparent so that the background image shows through a bit. 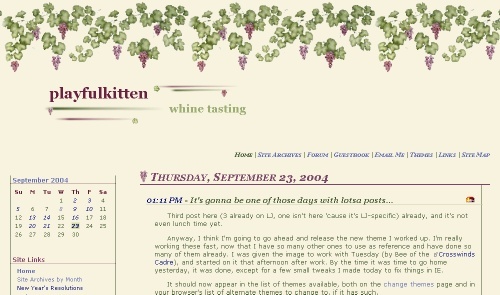 This style is inspired by a style written for LiveJournal called Flexible Squares, with the chief similarity being the main entry boxes. I liked how user icons were visually attached to a title rectangle, but floated to the left of both the title and body text, yet still included in the overall post box. Fully CSS2 standards compliant as all the rest. Only problem in IE is it does a few oddities with colors bleeding through text when scrolling. Firefox/Mozilla are all good, not sure about Opera though I'd guess it's fine given its good adherance to and support of standards. Note #2: I don't track who you are or what theme you like to have. I couldn't care less what (if anything) you use, unless you feel like dropping me a note saying what you like/don't like and why. (Constructive criticism is never a bad thing.) So I don't write down the IPs of who uses what. I just set a cookie w/ your choice. And if you feel your privacy would be invaded by that, then just leave it as default.